Recently I have been picking up some random lots of cards online where it isn’t entirely clear what cards will be included in the lot. I love this sort of thing…it’s like “Let’s Make a Deal” – if you remember that game show. You pick a curtain, take a little risk, and hope for the best. Sometimes you get what you expected, sometimes you get a variant that you didn’t have, and sometimes you get a rarity like that pressed penny card from a couple weeks back. I don’t think I have any cards in my collection that have a totally blank back. If I do, they would be buried somewhere in the recesses of the shoeboxes I store all my cards in, waiting to be discovered. But as part of this recent lot…I did find a blank backed card. It’s a variant on 01110236 dp 79905-C. 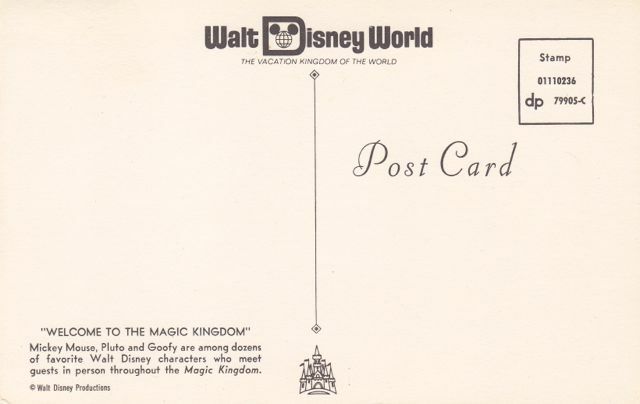 According to a fellow collector (you know who you are), there are three variants of this card; one with the Florida penant on the back, one without the penant (like the one I show here), and one with a “W” after the primary card number in the stamp box. As I said though, the card I got the other day is totally blank on the back. Go figure! Either way, this is a great card that has three classic Disney characters included. 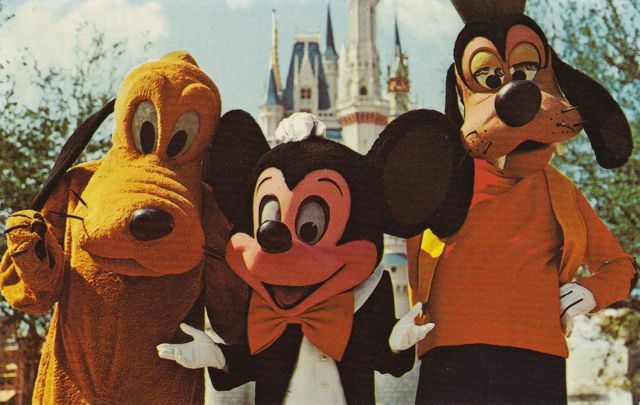 As an aside, speaking of Mickey, Pluto and Goofy – if you have never checked out the early Walt Disney Comics and Stories comic books from the 1940’s and 1950’s, they are a real treat. Mickey has a lot of wacky adventures with these two dogs! Things have stalled a little on data entry…but that won’t be the case for long. So keep your eyes peeled for changes. I am still thinking of having the entire NT database loaded by end of July (text only). I am working on scans too…slowly but surely. 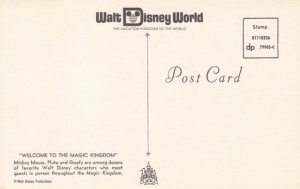 This entry was posted in Disney, Disney Postcards, Disney World, Disney World Postcards and tagged Disney World, Goofy, Magic Kingdom, Micke, Pluto, Walt Disney World. Bookmark the permalink.